Any enthusiast worth their salt will know the Intel X99 platform will remain the go-to solution for some time to come. No other setup can offer you eight cores and 16 threads in a single chip. Said processor is the Core i7-5960X, available for a cool £800, but the six-core, 12-thread Core i7-5820K, priced at a more palatable £300, is undoubtedly a better value bet. Eking out the best from these processors requires overclocking them by a healthy degree. But pushing these 140W TDP beasts by adding extra voltage and frequency brings the motherboards' circuitry into focus. Stealing a march on others in this regard was Asus, whose 'OC Socket' was the first to tap into the chips' voltage rails to offer, potentially, more stable performance at the bleeding edge. 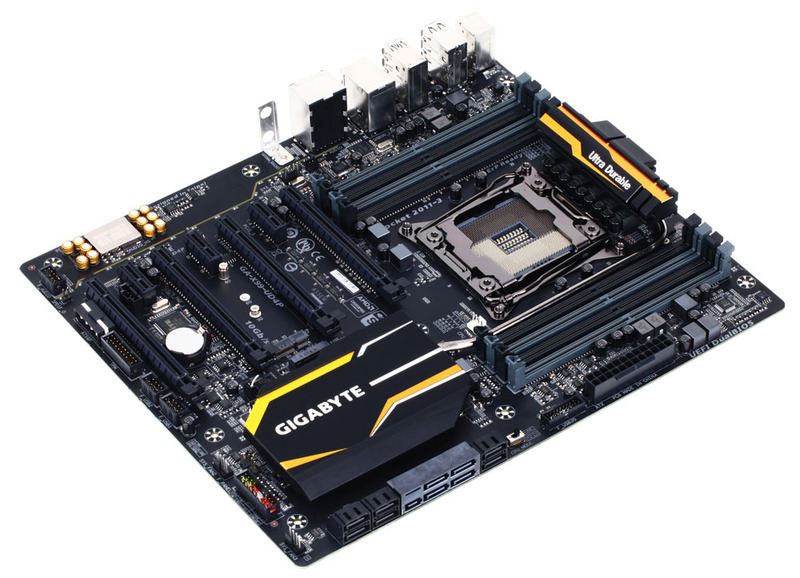 Gigabyte is also looking to woo the enthusiast with a new range of P-suffixed boards that offer its own version of a special socket. A case in point is the X99-UD4P, in for review today. The board looks rather fetching in the understated yellow and black livery though, like MSI, we would prefer the PCB to be bereft of the multitude of symbols and insignias that don't need to be there. But there's a lot of technology packed into the board, with Gigabyte claiming that the gold-plated socket 'improves board longevity,' though we can't imagine it would make much difference if you fit-and-forget your CPU. Testers like us, on the other hand, appreciate any feature that keeps a board going for longer. Power is fed by International Rectifier's controllers and PowIRstage integrated circuits. The purpose in using them is to control the current and, ultimately, temperature of the various VRMs for better longevity. Such moves are referred to as 'server-class' reliability, but there's no real way for a technology publication to examine their veracity in the short term. 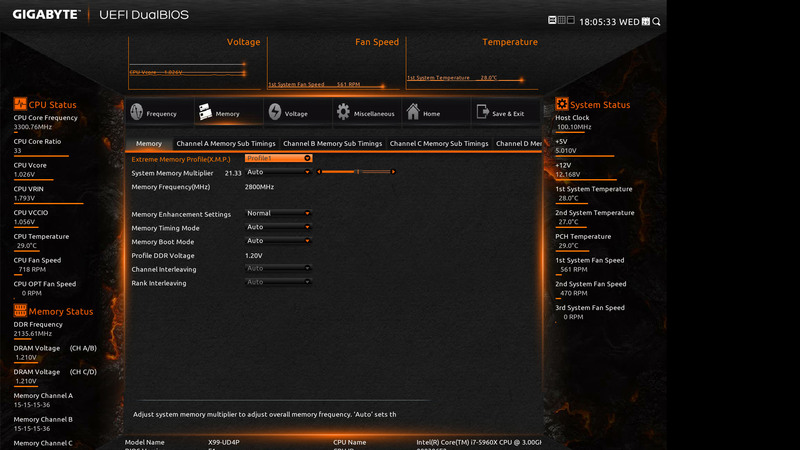 There's no active cooling on this model, thankfully, but Gigabyte does include a heatpipe between heatsinks. Neither gets warm to the touch under load, suggesting that it becomes useful when the board is overvolted and overclocked. The bottom heatsink lights up as does a strip that runs between the audio and PCIe slots. The big difference between this and the non-P board is the inclusion of what Gigabyte terms the 'CPU Mode Switch' - by the left-hand heatsink - that activates the extra pins in the socket, from 2011 to 2083, which is supposed to help in overclocking both the memory and CPU. 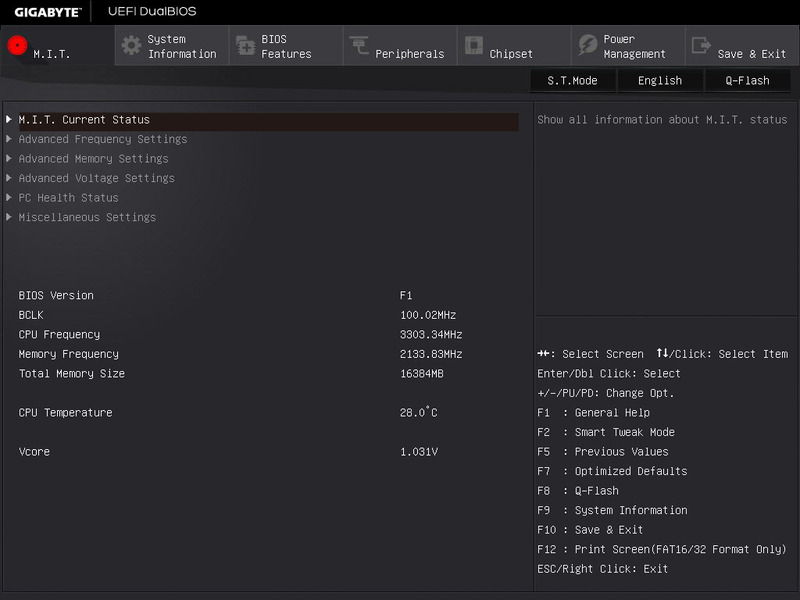 And Gigabyte has enough confidence to say that the UD4P can run very select memory at a lofty 3,333MHz through baked-in XMP settings. Eight slots surround the CPU socket and, on first glance, seem a little too close for comfort. But installing a Noctua NH-D15 cooling leaves plenty of space for the DIMMS. Where the board remains strong is with expansion. Four mechanical x16 PCIe slots, primarily for graphics, offers a full 40 lanes, on compatible CPUs. Interestingly, the third slot has a full 16 lanes allocated to it while the top two and bottom can use x8 and x8 and x8 in a full-on four-card SLI formation. Such focus on graphics leaves less bandwidth available to the two M.2 slots sandwiched between PCIe slots two and three. 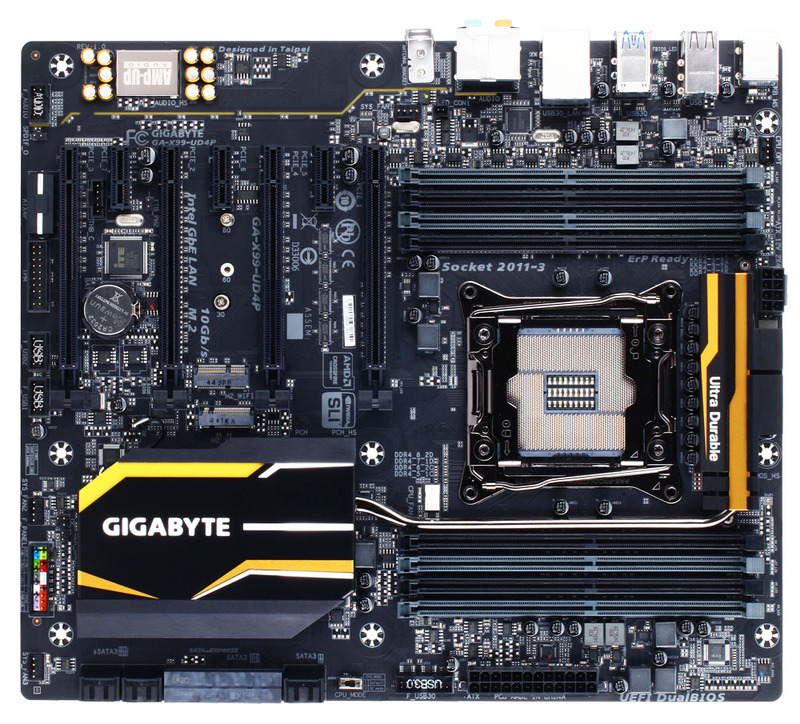 Other boards offer up to PCIe 3.0 x4 speeds hardwired to the CPU, but Gigabyte drops this to PCIe Gen 2.0 x2 here. The second slot is reserved for WiFi/Bluetooth cards. As usual, the M.2 slot is shares its bandwidth with SATA Express. Speaking of which, Gigabyte loads the board with 10 SATA ports, split between SATA 6Gbps, eSATA and SATA Express, and all run off the Intel chipset. So many expansion ports and storage devices compete for the PCIe lanes emanating from the CPU that not all can be serviced at once; motherboard manufacturers need to make sensible, informed decisions on how to divvy-up the resources. Gigabyte's implementation is heavy on graphics. 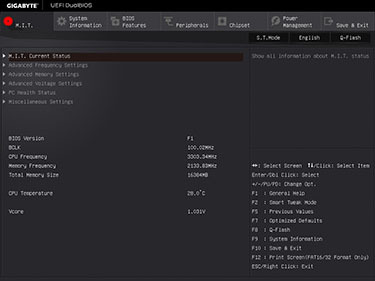 The company does deviate from an all-Intel chipset by using a Renesas controller for four additional USB 3.0, meaning the board has a total of 8 USB 3.0 and 4 USB 2.0. Six USB 3.0 on the back is always good to see, but the user can't determine easily which go straight into the Intel chipset and which run off Renesas. Two features stand out here; the white-coloured USB 3.0 also doubles up as the Q-Flash Plus, which enables the user to update the BIOS by using the .bin file stored on a compliant USB drive. The other non-standard item are the two holes for antennae belonging to a WiFi card that you can install in the upper M.2 slot. Priced at £190, or £10 more than the regular UD4, this revised motherboard should offer more overclocking potential than its predecessor. The new classic mode is a step up from the old one installed on the previous generation of boards in terms of appearance. Gigabyte has also increased the speed and smoothness of the mouse movements compared to the BIOS we saw in August last year. A slew of monitoring data is provided on both sides, with the central section designed for applying the various settings. Don't have a full-HD monitor? 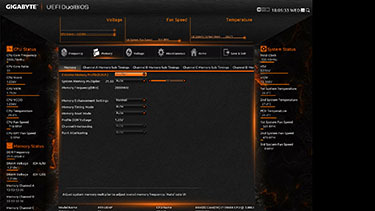 Gigabyte enables a lower-res version that does without the monitoring windows on either side. Six tabs at the top access a bunch of further sub-tabs. For example, you need to head to the miscellaneous section to gain access to the fan-speed control, which is located under the PC Health tab. Fan control isn't the most robust, however, with manual configuration that targets a particular RPM curve. That said, better fan control can be accessed via the downloadable EasyTune software for Windows.